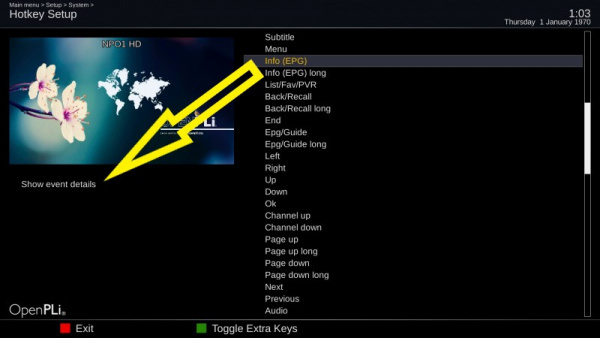 Hotkey are keys like the EPG key on your remote here is explained how to change the function that is assigned to a remote control key. 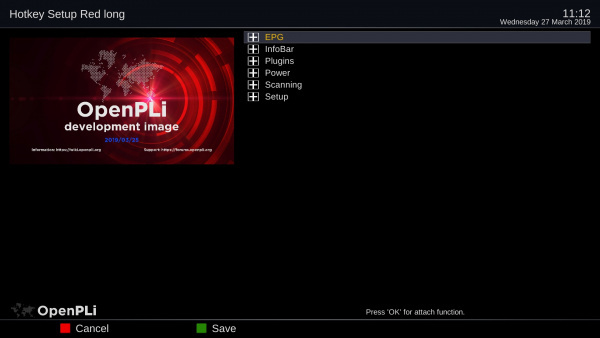 By default hotkey is not present in the Menu of OPenPLi so you have to change the User Mode to expert. 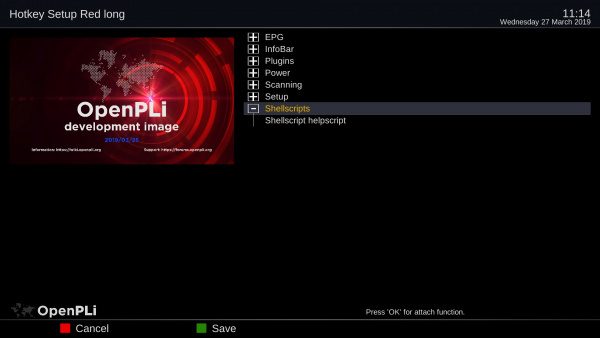 You can do this via Menu > Setup - System and then the second option in OpenPLi 7 this is Menu > Setup > System > Expert settings > User Mode. There you can change the level from 'normal' to 'expert'. 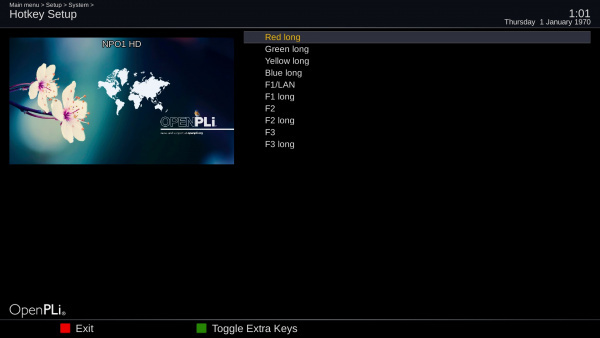 After this Go to Menu > Setup > System > Expert settings > Hotkey where you can edit Hotkey's. This nice feature gives you full control over your hotkeys and how they are defined. When you have opened the Hotkey feature as described above and press the key on you remote control you want to edit. As an example I will use the EPG key on your remote control press this key on your remote control and OpenPLi will jump to it. 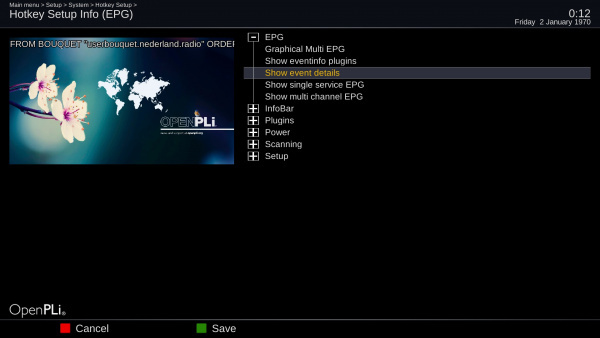 In screen above, on the left (the big yellow arrow points to it), there is show event details this is the default function when you press the EPG button on your remote. Now (when you see the Info (EPG) is yellow) you press the "OK" button on your remote and the categories (EPG-InfoBar-Plugins-etc.) are opened (picture below). If you press OK on the + it will open up the possibilities within a category. Then press OK button on your remote and the function Show event details is removed from the EPG button (picture with blue arrow). To add a new function select and press it like Graphical Multi EPG and this will be programmed in for the EPG key, don't forget to save with the green button (picture with green arrow). So by pressing a function it will be added and pressing it again will remove it from the key. 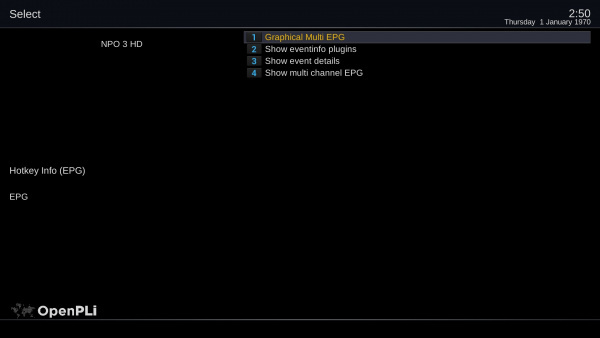 Note: you can toggle between left (attached function) and right (list) with Bouquets/Channel +/- buttons. To delete a programmed key, use the CH+/CH- button to select the programmed key and then press OK to delete the programmed key. It is possible to start a self created script using a hotkey, by default this function is not there so select. 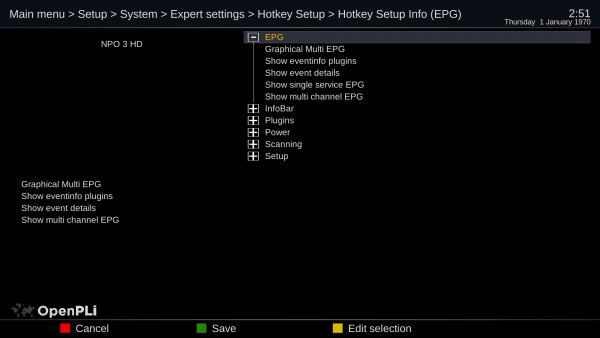 Below the result in the hotkey settings screen. This page was last modified on 27 March 2019, at 11:37.